“An American kneels only to his God, and always faces his enemy,”* declared William Logan Crittenden, refusing to kneel before his executioners in Havana this date in 1851. This well-bred** Kentuckian veteran of the Mexican-American War ditched a New Orleans customs-house gig when Narciso Lopez formed a private filibustering expedition to try to steal Cuba from the Spanish. Dear Uncle: In a few moments some fifty of us will be shot. We came with Lopez. You will do me the justice to believe that my motive was a good one. I was deceived by Lopez — he, as well as the public press,‡ assured me tat the island was in a state of prosperous revolution. I am commanded to finish writing at once. All this scene, including a post-mortem mutilation by the enraged mob of onlookers, became a bloody banner for U.S. Southerners — since expanding the slave power was core to the entire filibustering project. When word of the shootings reached New Orleans, a crowd sacked the Spanish consulate. But in the international relations game, the U.S. had disavowed filibustering and its raiders enjoyed no special diplomatic protection. When a number of the later prisoners were returned in chains to Spain, the Millard Fillmore administration asked their release, but had no grounds to demand it. It was a touchy diplomatic situation … one that our late Crittenden’s uncle, as a member of cabinet, was right in the middle of. Fillmore eventually secured the captives’ release, atoning the insult to the European power’s agents by causing the Spanish colors to be saluted in New Orleans in honor of the birth of the Infanta Isabella. All this mincing instead of brawling struck a certain variety of hothead as distinctly unmanful. * An alternative version has Crittenden declaring that Kentuckians kneel only to their God. ** According to this public domain book (pdf; it’s also on Google books) of the Lopez expedition, William Crittenden’s cousin George Bibb Crittenden — eventually a Confederate general — was among the Texan filibusters to survive the Black Bean Lottery. 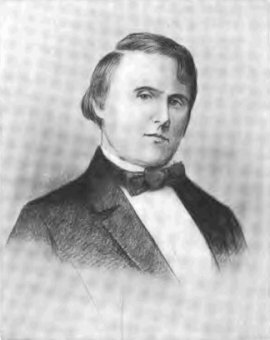 William Crittenden’s brother Thomas Theodore Crittenden fought on the Union side of the Civil War, and became Governor of Missouri in 1881. He’s noteworthy for having issued the bounty on outlaw Jesse James that led to the latter’s assassination by Robert Ford. † Family in the president’s cabinet was just no guarantee of preferential treatment, abroad or at home; just a few years before, a son of the sitting Secretary of War had been hanged at sea for mutiny. ‡ The Spanish press likewise excoriated American yellow journalism in terms that no few present-day scribes would also deserve. New Orleans papers, there is your work! There is the result of your diragations, of your iniquitous falsehoods, of your placards with large black letters, and your detestable extras … This blood must flow, drop by drop, upon your heads — this blood will torment you in your sleep, for they have lost their lives when you were in security in your houses. On this date in 1851, Venezuelan-born adventurer Narciso Lopez was garroted in Havana for his repeated expeditions to overturn Spanish dominion in Cuba. Narciso Lopez had fought for the Spanish against Simon Bolivar, and migrated to Cuba when Bolivar carried the day. Initially a loyal government functionary, Lopez gradually became sweet on the anti-Spanish cause, and fled Cuba for the United States (pursued by a death sentence in absentia) when a treasonable conspiracy of his was discovered. Like MacArthur, he meant to return — and did. Lopez crisscrossed the United States, drumming up support for filibustering raids on Cuba meant to detach it from Spain and make it an American slave state. In this proposed enterprise, wedded alike to both national expansionism and southern sectionalism, Lopez rubbed shoulders with the likes of Jefferson Davis and Robert E. Lee, even helping precipitate criminal charges against a former U.S. Senator who backed him. But the five expeditions went from bad to worse, until Lopez was captured in August 1851. Tom Chaffin’s Fatal Glory: Narciso Lopez and the First Clandestine U.S. War Against Cuba, describes the scene of his death, just days after capture. Between the wide Gulf sky and the waters of Havana harbor, the Gothic Morro Castle’s high tabby walls gleamed in the Sunday morning light on September 1, 1851. Though it was barely seven o’clock, a noisy crowd of four thousand already had gathered in a public plaza just across the harbor from the Morro. The plaza spread below the walls of the Punta, a small citadel guarding the western side of Havana’s finger-shaped harbor. At the center of the crowd’s attention on the cloudless dawn was a ten-foot high wooden scaffold that rose from the plaza. At its top was a garrote, an iron chair with a pair of clasps on its back. The mechanics of this grim machine were simple: just below its clasps, designed to grip the condemned man’s head, was a metal collar for his throat. With a turn of the screw on the garrote’s back, the collar tightens, strangling the prisoner. He bowed, took his seat in the iron chair, and eased his head back. The executioner, a black man, placed the iron clamps around Lopez’s throat. His feet were then tied to bolts on the sides of the chair. He exchanged a few words with his friends and kissed a small cross. Then, with a turn of a screw, Narciso Lopez’s three-year campaign to vanquish Spain’s dominion over Cuba came to an end. This forbidding example put a real damper on American plans to annex Cuba (for a while), but hardly stanched the North American appetite for filibustering. Despite the bad end of his own project, Lopez managed to bequeath the eventually independent Cuba the flag (Spanish link) which it still flies today.